For the past 36 hours, all of my “Send Email” commands no longer work. Same here. I usually get a email with my solar stats from the day before at 4am. Errors for the last 2 days. I thought about that too, but mine stopped 8 hours before the 31st. Has anyone tested emails sent to a different domain yet? account problem with the webcore mail service? I am having the same issue, email is being sent to a gmail hosted domain. Stopped on Mar30.19. @RobinWinbourne was getting in touch with @ady624 to update Mailgun problems impacting the forums, seems that issue extends to the dashboard as well. I spoke to Adrian and he was busy at the time, he was going to look at it the next morning and must have got side-tracked. Same problem. No email going out. I am having the same problem with “Error sending emails” since 3/31. Looks like the last successful email sent from a piston was on 3/30 at 7:30 am central time. I have done some testing and it happens with both gmail hosted emails as well as others to so not sure it is completely related to Google change. First, thanks for your great work! I am new, and have a ST and a WebCore account, with the same email address. Will my email address automatically be used when setting up pistons to send emails? I am currently struggling to get a simple piston to send me any emails. Trying to figure out what I am doing wrong here. Thanks again! Your forum accounts have nothing to do with your ST account or webCoRE instance. They are back up now though. You are right, I still can’t get emails to send regardless of how I write the piston. This is after the email service restoration. I wrote a simple test piston to send me an email if a light is turned on, and nothing ever sends. Thanks for your hep with this! 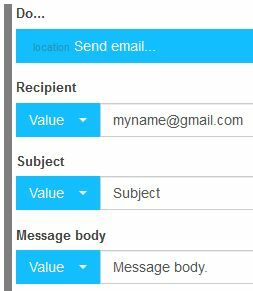 I just created a piston to send myself an email and it worked. sent it to my gmail. Just re-wrote my piston like yours, and it is working now!! Not sure why the other one didn’t work, but I will take it. Thank you so much for helping me out!